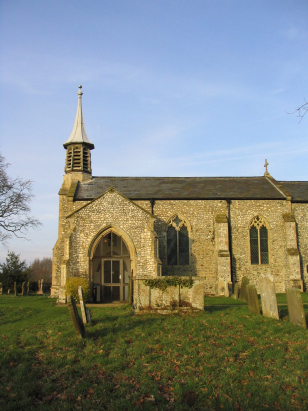 The parish of Aldborough lies in northeastern Norfolk a few miles north of the market town of Aylsham and just west of the A140 road which links Norwich to Cromer. Aldborough lies adjacent to the Scarrow Beck a small tributary of the River Bure in a maze of lanes. Aldborough's glory is its village green an archetypal expanse of common at the heart of the village and a real asset to the community. Although a quiet rural spot Aldborough appears to be retaining its village facilities with a thriving village pub at the core. St Mary's church is something of a hybrid. 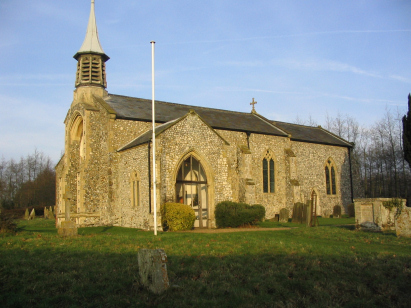 Although lacking a tower (the original fell in the 18th century) there are indications that the church is very old for Norfolk. Some use of carrstone possibly indicates a Norman origin although the windows are clearly of the 14th century. Much of the church was altered and repaired in the 1840s and this clearly masks some features, the ensemble was topped off with the present bell tower an early twentieth century addition. A single standard 800-entry register book covers the period of the transcript and continues to the early twentieth century. This register is filmed on microfiche 3 & 4 in the collection of the Norfolk Record Office and from which this transcript was prepared. The fiche, while elderly, are adequate to the task despite some fading of the images and as a result this was a fairly straightforward transcript to prepare. It is to be hoped that few errors will have crept into its production.